Madden NFL 18 is one of those games that intrigues a lot of people, including those with only have a passing interest in American football. That’s why we’ve created a guide listing the best beginner Madden 18 tips and tricks to strengthen your defence and turn your offence into an unstoppable machine. If you’re not sure how they work, it will put you off almost instantly but understanding the pros and cons of each is essential if you want to have a productive game of football. Formations are intimidating. You can execute any play regardless what formation you have, but certain lineups are going to be more successful depending what you’re trying to achieve. If you’re truly new to the series you’re best off starting with a team like the Miami Dolphins who more often than not stick to three formations. If you’re looking for a more balanced approach that lets you think more on your feet, always use Singleback. It’s best to use the I Formation, Strong I or Weak I to run the ball and Shotgun if you feel the need to go for a long pass. Naturally you have defensive formations on top of this, and the key ones are 4-3 – which will give you coverage against most plays – 4-4 – to slow down running plays and potentially blitz the QB – and 3-4 – which will target an opponent’s running back. There are more options which will usually lean slightly more towards running the ball or passing, but as general rule the above will help your game no end. So you’ve chosen your formation and play and you’re feeling pretty good about the upcoming down. The thing is, that’s really where the game starts. There’s every chance they’ve read you perfectly and are set up to stop you making any gains. Before the ball has even be handed off it’s imperative to look at your opponent and see how its defence has lined up and then try to figure out if your idea is going to work. You can also call hot routes which will specifically let you change the pathway of a receiver to circumvent the defence immediately. This is where you have to be smart. A quick press of R3 will take you to an in-play menu where you can call an audible to rearrange your line-up to give you the upper hand. It is, however, crucial when you get further into the game. A lot of this will be trial and error at first as you start learning how to read another team and understanding what is and isn’t possible. Naturally passing the ball is incredibly important in Madden but it’s not just a case of tapping a button and seeing it perfectly fall into your receiver’s hands. Where Madden 18 is concerned EA has delayed the amount of time it takes for a receiver to get into the right position so being patient and holding off an extra half-second before allowing your QB to make an attempt will make all the difference. Instead you have to learn the system and work out what each pass means. Bullet Passes, as they sound, are short, quick passes best suited for short attempts whereas Touch Passes allow you to control the pass with more finesse, making them better in situations where you’re trying to steer your receiver near the sidelines. There’s also numerous types of passes you can unleash and, again, choosing the right one for the right situation could be the reason you complete a play. 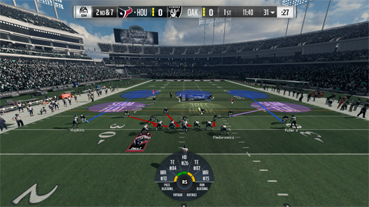 Are you finding much more NFL 18 news and guides on latest ratings. Find much more here at mmocs.com. And buy more Cheap Madden NFL 18 Coins here you get the most satisfying service here. FIFA 18 demo is only a two weeks now. This means that for those who did not try to play the game machine or the game section, waiting to finally ended. Here, we will learn more about what you need to understand – how long it takes to download and how to master the skills and skills ahead of the game. The FIFA 18 demo will arrive on September 15, which is two weeks before the launch. Although it has not yet been determined, it seems that the virtual certainty of the PlayStation 4 demo will fall on the same day as roughly the same time. In view of the time zone and recent history, those who make every effort to change their console area to New Zealand / Australia / etc may be able to enter as early as on the 14th. 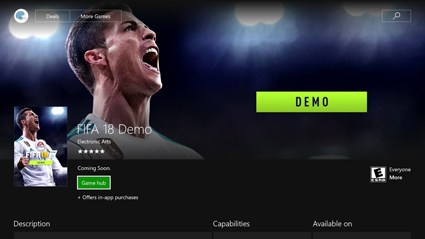 Can I See FIFA 18 Demo at Xbox store? Yes, look around, you will see the demo, appear in the Ronaldo Nazaria loan label, but it can not download. However, it does reveal some key information about expectations. The size of the demo is about 7.3GB, very large, so it is expected that the download time will take at least an hour or two, depending on the connection. The demo will appear in Origin, PS Store, and Xbox Live. It will be “featured” and should be easy to find. If you have any questions, please use the “Search” function and enter “FIFA 18 Demo”. When you find it, click “Download” to start the process. It all depends on your connection – but more than 7GB is quite big. The server will be under pressure, as long as how many people will download it, so earlier you can download the game the better. In order to give yourself the best chance, make sure to connect the console to an Ethernet cable. You will see a little faster speed. Also, try and disconnect other things while you download. FIFA 18 comes out for PS4, Xbox One, PC and Nintendo Switch on September 29th. Lastly, share the 3% off coupon code: mmocscode3 to buy FIFA 18 coins to you, don’t forget to use it! Thanks for your reading! Hope it’s helpful to you!